Metoclopramide is a medication used mostly for stomach and esophageal problems. It is commonly used to treat and prevent nausea and vomiting, to help with emptying of the stomach in people with delayed stomach emptying, and to help with gastroesophageal reflux disease. It is also used to treat migraine headaches. Common side effects include: feeling tired, diarrhea, and feeling restless. More serious side effects include: movement disorder like tardive dyskinesia, a condition called neuroleptic malignant syndrome, and depression. It is thus rarely recommended that people take the medication for longer than twelve weeks. It is pregnancy category B in the United States and category A in Australia, meaning no evidence of harm has been found after being taken by many pregnant women. It belongs to the group of medications known as dopamine-receptor antagonists and works as a prokinetic. In 2012, metoclopramide was one of the top 100 most prescribed medications in the United States. It is on the World Health Organization's List of Essential Medicines, the most effective and safe medicines needed in a health system. It is available as a generic medication. The wholesale cost in the developing world as of 2014 is US$0.003 to US$0.08 per pill. In the United States a month worth of medication is generally less than US$25. In 2016 it was the 250th most prescribed medication in the United States with more than 1 million prescriptions. Metoclopramide is commonly used to treat nausea and vomiting associated with conditions such as uremia, radiation sickness, cancer and the effects of chemotherapy, labor, infection, and emetogenic drugs. As a perioperative anti-emetic, the effective dose is usually 25 to 50 mg (compared to the usual 10 mg dose). It is also used in pregnancy as a second choice for treatment of hyperemesis gravidarum (severe nausea and vomiting of pregnancy). It is also used preventatively by some EMS providers when transporting people who are conscious and spinally immobilized. In migraine headaches, metoclopramide may be used in combination with paracetamol (acetaminophen) or in combination with aspirin. Evidence also supports its use for gastroparesis, a condition that causes the stomach to empty poorly, and as of 2010 it was the only drug approved by the FDA for that condition. It is also used in gastroesophageal reflux disease. While metoclopramide is used to try to increase breast milk production, evidence that it is effective for this is poor. Its safety for this use is also unclear. While metoclopramide reduces gastric volume and acidity, there is not enough evidence to say that it reduces the incidence of pulmonary aspiration. Metoclopramide is contraindicated in pheochromocytoma. It should be used with caution in Parkinson's disease since, as a dopamine antagonist, it may worsen symptoms. Long-term use should be avoided in people with clinical depression, as it may worsen one's mental state. It is contraindicated for people with a suspected bowel obstruction and in epilepsy, if a stomach operation has been performed in the previous three or four days, if the person has ever had bleeding, perforation or blockage of the stomach, and in newborn babies. People with a history of ADHD, restless legs syndrome, hyperprolactinaemia, and Parkinson's disease should be closely monitored when using dopamine antagonists for treatment of emesis. People who take antipsychotics are recommended not to take metoclopramide. The safety of the drug was reviewed by the European Medicines Agency in 2011, which determined that it should not be prescribed in high doses, for periods of more than five days, or given to children below 1 year of age. They suggested its use in older children should be restricted to treating post-chemotherapy or post-surgery nausea and vomiting, and even then only for patients where other treatments have failed. For adults, they recommended its use be restricted to treating migraines and post-chemotherapy or post-surgery patients. Metoclopramide has long been used in all stages of pregnancy with no evidence of harm to the mother or unborn baby. In the US, it has been assigned to pregnancy category B by the US FDA. A large cohort study of babies born to Israeli women exposed to metoclopramide during pregnancy found no evidence that the drug increases the risk of congenital malformations, low birth weight, preterm birth, or perinatal mortality. A large cohort study in Denmark found, in addition, no association between metoclopramide exposure and miscarriage. 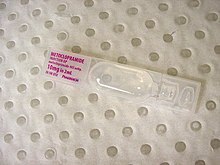 Metoclopramide is excreted into milk. A systematic review found a wide range of reported outcomes for treatment of gastroesophageal reflux disease (GERD) in infants and concluded a "poor" rating of evidence and "inconclusive" rating of safety and efficacy for the treatment of GERD in infants. Common adverse drug reactions (ADRs) associated with metoclopramide therapy include restlessness (akathisia), and focal dystonia. Infrequent ADRs include hypertension, hypotension, hyperprolactinaemia leading to galactorrhea, depression, headache, and extrapyramidal effects such as oculogyric crisis. Rare but serious ADRs associated with metoclopramide therapy include agranulocytosis, supraventricular tachycardia, hyperaldosteronism, neuroleptic malignant syndrome, akathisia and tardive dyskinesia. Metoclopramide may be the most common cause of drug-induced movement disorders. The risk of extrapyramidal effects is increased in people under 20 years of age, and with high-dose or prolonged therapy. Tardive dyskinesia may be persistent and irreversible in some people. The majority of reports of tardive dyskinesia occur in people who have used metoclopramide for more than three months. Consequently, the US Food and Drug Administration (FDA) recommends that metoclopramide be used for short-term treatment, preferably less than 12 weeks. In 2009, the FDA required all manufacturers of metoclopramide to issue a black box warning regarding the risk of tardive dyskinesia with chronic or high-dose use of the drug. Dystonic reactions may be treated with benzatropine, diphenhydramine, trihexyphenidyl, or procyclidine. Symptoms usually subside with diphenhydramine injected intramuscularly. Agents in the benzodiazepine class of drugs may be helpful, but benefits are usually modest and side effects of sedation and weakness can be problematic. In some cases, the akathisia effects of metoclopramide are directly related to the infusion rate when the drug is administered intravenously. Side effects were usually seen in the first 15 min after the dose of metoclopramide. Metoclopramide appears to bind to dopamine D2 receptors with nanomolar affinity (Ki = 28.8 nM), where it is a receptor antagonist, and is also a mixed 5-HT3 receptor antagonist/5-HT4 receptor agonist. The gastroprokinetic activity of metoclopramide is mediated by muscarinic activity, D2 receptor antagonist activity, and 5-HT4 receptor agonist activity. The gastroprokinetic effect itself may also contribute to the antiemetic effect. Metoclopramide also increases the tone of the lower esophageal sphincter. Metoclopramide increases peristalsis of the duodenum and jejunum, increases tone and amplitude of gastric contractions, and relaxes the pyloric sphincter and duodenal bulb, while simultaneously increasing lower esophageal sphincter tone. These gastroprokinetic effects make metoclopramide useful in the treatment of gastric stasis (for example: after gastric surgery or diabetic gastroparesis), as an aid in gastrointestinal radiographic studies by accelerating transit through the gastrointestinal system in barium studies, and as an aid in difficult intubation of the small intestine. Metoclopramide is a substituted benzamide; cisapride and mosapride are structurally related. Metoclopramide was first described by Louis Justin-Besançon and Charles Laville in 1964, while working to improve the anti-dysrhythmic properties of procainamide. That research project also produced the product sulpiride. The first clinical trials were published by Tourneu et al. in 1964 and by Boisson and Albot in 1966. Justin-Besançon and Laville worked for Laboratoires Delagrange and that company introduced the drug as Primperan in 1964. Laboratoires Delagrange was acquired by Synthelabo in 1991 which eventually became part of Sanofi. A.H. Robins introduced the drug in the US under the tradename Reglan in 1979 as an injectable and an oral form was approved in 1980. in 1989 A.H. Robins was acquired by American Home Products, which changed its name to Wyeth in 2002. The drugs were initially used to control nausea for people with severe headaches or migraines, and later uses for nausea caused by radiation therapy and chemotherapy, and later yet for treating nausea caused by anesthesia. In the US the injectable form was labelled for chemotherapy-induced nausea and the oral form was eventually labelled for gastroesophageal reflux disease. It became widely used in the 1980s, becoming the most commonly used drug to treat anesthesia-induced nausea and for treating gastritis in emergency rooms. The first generics were introduced in 1985. In the early 1980s signs began to emerge in pharmacovigilance studies from Sweden that the drug was causing tardive dyskinesia in some patients. The FDA required a warning about tardive dyskinesia to be added to the drug label in 1985 stating that: "tardive dyskinesia . . . may develop in patients treated with metoclopramide,” and warned against use longer than 12 weeks, as that was how long the drug has been tested. In 2009 the FDA required that a black box warning be added to the label. The emergence of this severe side effect led to a wave of product liability litigation against generic manufacturers as well as Wyeth. The litigation was complicated since there was a lack of clarity in jurisdiction between state laws, where product liability is determined, and federal law, which determines how drugs are labelled, as well as between generics companies, which had no control over labelling, and the originator company, which did. The litigation yielded at least two important cases. In Conte v. Wyeth in the California state courts, the claims of the plaintiff against the generic companies Pliva, Teva, and Purepac that had sold the drugs that the plaintiff actually took, and the claims against Wyeth, whose product the plaintiff never took, were all dismissed by the trial court, but the case was appealed, and in 2008 the appellate court upheld the dismissal of the cases against the generic companies, but reversed on Wyeth, allowing the case against Wyeth to proceed. This established an "innovator liability" or "pioneer liability" for pharmaceutical companies. The precedent was not widely followed in California nor in other states. Litigation over the same issues related to metoclopramide also reached the US Supreme Court in PLIVA, Inc. v. Mensing, in which the court held in 2011 that generic companies cannot be held liable for information, or the lack of information, on the originator's label. As of August 2015 there were about 5000 suits pending across the US, efforts to consolidate them into a class action had failed, and "companies have paid millions in compensation to those suffering from tardive dyskinesia after taking Reglan/metoclopramide." Shortly following the Pliva decision, the FDA proposed a rule change that would allow generics manufacturers to update the label if the originating drug had been withdrawn from the market for reasons other than safety. As of May 2016 the rule, which turned out to be controversial since it would open generic companies to product liability suits, was still not finalized, and the FDA had stated the final rule would be issued in April 2017. The FDA issued a draft guidance for generic companies to update labels in July 2016. Metoclopramide is also commonly used to prevent vomiting in cats and dogs. It is also used as a gut stimulant in rabbits. ^ "Metoclopramide". Nlm.nih.gov. Retrieved 28 September 2014. ^ a b c d e f g h i j k "Metoclopramide hydrochloride". Monograph. The American Society of Health-System Pharmacists. Retrieved 2014-09-27. ^ Becker, WJ (June 2015). "Acute Migraine Treatment in Adults". Headache. 55 (6): 778–93. doi:10.1111/head.12550. PMID 25877672. ^ Bartholow, Michael. "Top 200 Drugs of 2012". Pharmacy Times. Retrieved 22 April 2014. ^ "Metoclopramide HCL". International Drug Price Indicator Guide. Retrieved 23 August 2016. ^ Hamilton, Richart (2015). Tarascon Pocket Pharmacopoeia 2015 Deluxe Lab-Coat Edition. Jones & Bartlett Learning. p. 262. ISBN 9781284057560. ^ a b "Maxolon (Australian Approved Product Information)". Valeant Pharmaceuticals. 2000. Archived from the original on 2011-11-07. ^ a b c d Rossi S., ed. (2006). Australian Medicines Handbook. Adelaide: Australian Medicines Handbook. ISBN 978-0-9757919-2-9. ^ a b "Metoclopramide Hydrochloride 5mg/5ml Oral Solution - - (eMC)". xpil.medicines.org.uk. ^ Derry, Sheena; Moore, R. Andrew (2013-04-30). "Paracetamol (acetaminophen) with or without an antiemetic for acute migraine headaches in adults". The Cochrane Database of Systematic Reviews (4): CD008040. doi:10.1002/14651858.CD008040.pub3. ISSN 1469-493X. PMC 4161111. PMID 23633349. ^ a b Rao, AS; Camilleri, M (2010). "Review article: metoclopramide and tardive dyskinesia". Aliment. Pharmacol. Ther. 31 (1): 11–9. doi:10.1111/j.1365-2036.2009.04189.x. PMID 19886950. ^ a b "DailyMed - METOCLOPRAMIDE- metoclopramide injection, solution". Dailymed.nlm.nih.gov. Retrieved 21 January 2018. ^ Bazzano, AN; Hofer, R; Thibeau, S; Gillispie, V; Jacobs, M; Theall, KP (2016). "A Review of Herbal and Pharmaceutical Galactagogues for Breast-Feeding". The Ochsner Journal. 16 (4): 511–524. PMC 5158159. PMID 27999511. ^ Forinash, AB; Yancey, AM; Barnes, KN; Myles, TD (October 2012). "The use of galactogogues in the breastfeeding mother". The Annals of Pharmacotherapy. 46 (10): 1392–404. doi:10.1345/aph.1R167. PMID 23012383. ^ a b Briggs, G. G.; Freeman, R. K.; Yaffe, S. J. (2008). Drugs in Pregnancy and Lactation (8th ed.). Philadelphia: Lippincott Williams & Wilkins. pp. 1197–1200. ISBN 978-0-7817-7876-3. Retrieved 2009-06-11. ^ "Metoclopramide: Uses, Dosage, Side Effects". Drugs.com. Retrieved 21 January 2018. ^ Matok, I.; Gorodischer, R.; Koren, G.; Sheiner, E.; Wiznitzer, A.; Levy, A. (2009). "The Safety of Metoclopramide Use in the First Trimester of Pregnancy". New England Journal of Medicine. 360 (24): 2528–2535. doi:10.1056/NEJMoa0807154. PMID 19516033. ^ Pasternak, B. R.; Svanström, H.; Mølgaard-Nielsen, D.; Melbye, M.; Hviid, A. (2013). "Metoclopramide in Pregnancy and Risk of Major Congenital Malformations and Fetal Death". JAMA. 310 (15): 1601–1611. doi:10.1001/jama.2013.278343. PMID 24129464. ^ Hibbs, AM; Lorch, SA (Aug 2006). "Metoclopramide for the treatment of gastroesophageal reflux disease in infants: a systematic review". Pediatrics. 118 (2): 746–52. doi:10.1542/peds.2005-2664. PMID 16882832. ^ a b c d "FDA requires boxed warning and risk mitigation strategy for metoclopramide-containing drugs" (Press release). U.S. Food and Drug Administration. 2009-02-26. Retrieved 2009-06-11. "Lay Summary – WebMD". ^ Olanow C, Schapira AV. Chapter 372. Parkinson's Disease and Other Movement Disorders. In: Longo DL, Fauci AS, Kasper DL, Hauser SL, Jameson J, Loscalzo J. eds. Harrison's Principles of Internal Medicine, 18e. New York, NY: McGraw-Hill; 2012. ^ Parlak, I; Atilla, R; Cicek, M; Parlak, M; Erdur, B; Guryay, M; Sever, M; Karaduman, S (Sep 2005). "Rate of metoclopramide infusion affects the severity and incidence of akathisia". Emergency Medicine Journal. 22 (9): 621–4. doi:10.1136/emj.2004.014712. PMC 1726928. PMID 16113179. ^ "Prediction of Catalepsies Induced by Amiodarone, Aprindine and Procaine: Similarity in Conformation of Diethylaminoethyl Side Chain" (PDF). Jpet.aspetjournals.org. Retrieved 21 January 2018. ^ Rang, H. P.; Dale, M. M.; Ritter, J. M.; Moore, P. K. (2003). Pharmacology (5th ed.). Edinburgh: Churchill Livingstone. ISBN 978-0-443-07145-4. ^ Sweetman S., ed. (2004). Martindale: The Complete Drug Reference (34th ed.). London: Pharmaceutical Press. ISBN 978-0-85369-550-9. ^ Tonini, M.; Candura, S. M.; Messori, E.; Rizzi, C. A. (1995). "Therapeutic Potential of Drugs with Mixed 5-HT4 Agonist/5-HT3 Antagonist Action in the Control of Emesis". Pharmacological Research. 31 (5): 257–260. doi:10.1016/1043-6618(95)80029-8. ISSN 1043-6618. PMID 7479521. ^ Feldman, M.; Friedman, L. S.; Brandt, L. J., eds. (2010). "Ch. 43: Gastroesophageal Reflux Disease". Sleisenger and Fordtran's Gastrointestinal and Liver Disease (9th ed.). Philadelphia: Saunders. ISBN 978-1-4160-6189-2. ^ a b c Walter Sneader (31 October 2005). Drug Discovery: A History. John Wiley & Sons. pp. 205–. ISBN 978-0-470-01552-0. ^ Sanger, GJ (2009). "Translating 5-HT receptor pharmacology". Neurogastroenterol. Motil. 21 (12): 1235–8. doi:10.1111/j.1365-2982.2009.01425.x. PMID 19906028. ^ Justin-Besancon, Louis; Laville, Charles (1964). "Antiemetic Action of Metoclopramide with Respect to Apomorphine and Hydergine". Comptes Rendus des Séances de la Société de Biologie et de Ses Filiales (in French). 158: 723–727. PMID 14186927. ^ "Laboratoires Delagrange (1932) - Organisation - Resources from the BnF". Data.bnf.fr. Retrieved 21 January 2018. ^ "A.H. Robins Company - Virginia Historical Society A Guide to the A. H. Robins Company Records, 1885–2004". Vahistorical.org. Retrieved 21 January 2018. ^ "All About Metoclopramide (Reglan) - Emergency Physicians Monthly". Epmonthly.com. Retrieved 21 January 2018. ^ Wiholm, BE; Mortimer, O; Boethius, G; Häggström, JE (1984). "Tardive dyskinesia associated with metoclopramide" (PDF). Br Med J (Clin Res Ed). 288 (6416): 545–7. doi:10.1136/bmj.288.6416.545. PMC 1444584. PMID 6421373. ^ Conte v. Wyeth, Inc., 85 Cal. Rptr. 3d 299, 304–05 (Ct. App. 2008). ^ "PLIVA, Inc. v. Mensing". Scotusblog.com. Retrieved 21 January 2018. ^ "Reglan & Tardive Dyskinesia". Drugwatch.com. Retrieved 21 January 2018. ^ Patel, Jeff Rossen and Avni. "FDA moves to make generic drugmakers more accountable". Today.com. Retrieved 21 January 2018. ^ "FDA delays rule to allow generic drug makers to change labels". Statnews.com. 19 May 2016. Retrieved 21 January 2018. ^ Hamilton, Richard J. (2010). Tarascon Pharmacopoeia 2010 Library Edition. Jones & Bartlett Learning. p. 170. ISBN 9780763777685. ^ Mikota, S. K.; Plumb, D. C. (June 2003). "Metoclopramide HCl". The Elephant Formulary. Elephant Care International. Archived from the original on 2003-12-29.